The first Saturday in May may be Derby Day, but the first Sunday is May is for GSD! Join us for a great session starting with Jeremy Smith, founder of Map the Vote on how we'll use the software to boost turnout in 2020. Our club will be among the first to see and test this new enhanced product. 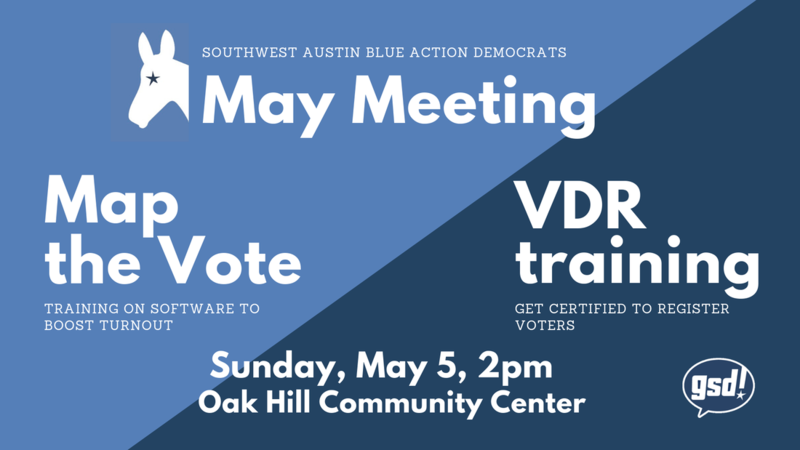 Then, stay to get certified to register voters in Travis County, starting at 3pm. Sign up here so we make sure we have enough training materials. ​Meet us at the Oak Hill Community Center starting at 2pm. Blue Action Democrats is a new Democratic club in Southwest Austin. And we're doing things differently. First of all, we want to get sh*t done. It's great to talk about what's wrong in our politics, but what are we going to do about it? We're ready to act. And we need you to join us to tackle specific, actionable tasks that you can do on a Saturday morning or Sunday afternoon that will elect more Democrats in Texas.